Multiple domain names pointing to the same site? Google will penalize you if you have duplicate content under two or more domain names, but if you have a domain you use for a print or tv campaign, and use Google Analytics or another web analytics program, you can set up to following situation to track the campaign. Use the Google URL Builder to create a URL that will work with Google Analytics. Another thing to remember is the www.primarydomain.com and primarydomain.com are different domains in the eyes of Google, so make sure you pick one and stick with it for all your linking, SEO, and other online marketing. You can also set the primary domain in Google Webmasters tools. SEO is more than just domain name, so make sure the content of the site is strong and there are lots of high quality incoming links. Google Webmasters tools are a free way to get some good insight in to your domain. There are better tools out there, but Google Webmaster tools is a good first start. This entry was posted in Google, SEO on August 28, 2008 by TGK Admin. 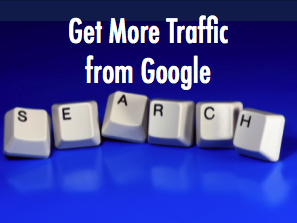 I am teaching another free class on how to boost your web traffic through paid and organic search traffic at the Pleasure Island Chamber of Commerce located in Carolina Beach on Wednesday 9/17 from 6-8:30 pm. The class is for anyone who wants to drive more traffic to their web site through paid (cost per click) or free (organic) searches. You will learn the basics and some advanced tips on search engine optimization and building links and how to track your website traffic. This is the same class I have taught at CFCC. Read more about it after the jump. This entry was posted in CFCC, Google on June 18, 2008 by TGK Admin. I am teaching a class on how to boost your web traffic through paid and organic search traffic at Wilmington, NC’s Cape Fear Community College on Tuesday Mar. 25th from 6:00pm to 8:30pm. This is the second time I will be teaching this specific class, and I was well attended last time, so you must register before hand. Visit www.cfcc.edu/sbc/ for more information. Registration Information after the jump. This entry was posted in CFCC, Google on February 27, 2008 by TGK Admin.